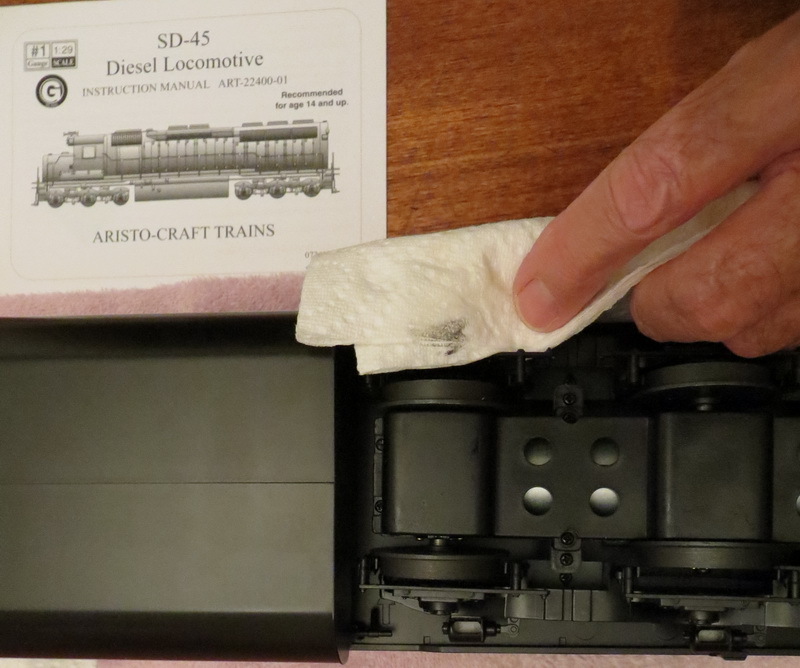 Since I had not done this task in quite sometime - it having becoming sort of a lost art - I thought I would share the method I use on what is now my 9th Aristo-Craft SD45. 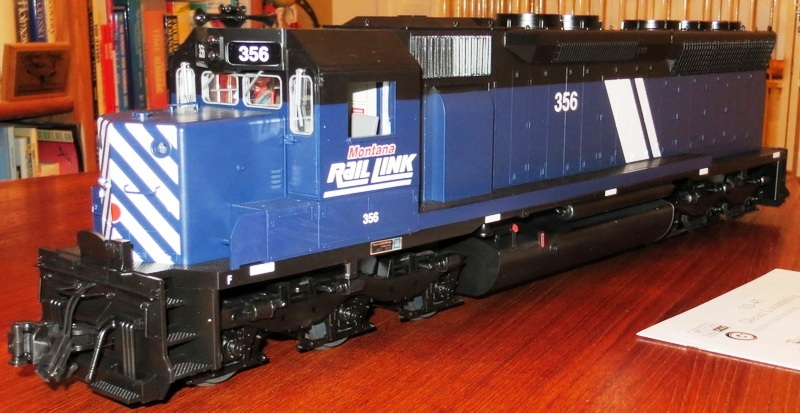 It is to be appreciated that up to now the SD45 does not come with factory installed side railings like that of the newer Aristo Dash 9 and GP40 locos. 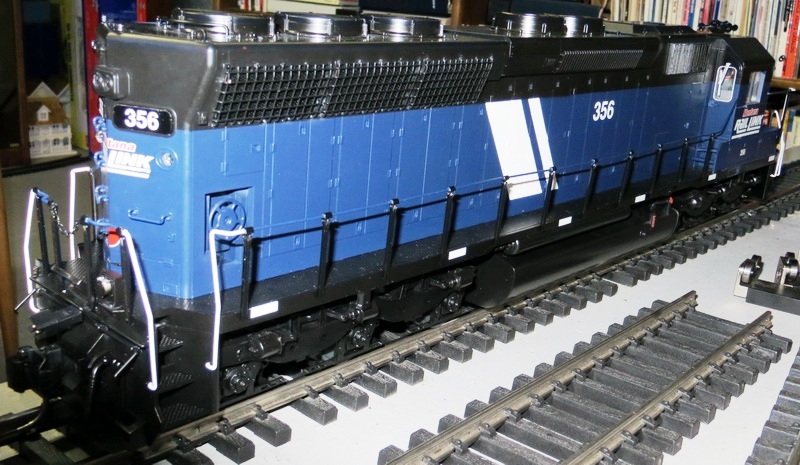 For future SD45 production runs, It would be a welcomed upgrade for Aristo to have the factory install the railings, but until then it will have to be done by us customers. Having taken advantage of an Aristo special sales offer, I purchased a Santa Fe SD45 loco in the blue & yellow livery to operate with the two Kodachrome ones I have. This new old stock (NOS) out of the box Aristo Santa Fe SD45 will be used as an example to describe and show how the optional extra weights and its railings had been installed. 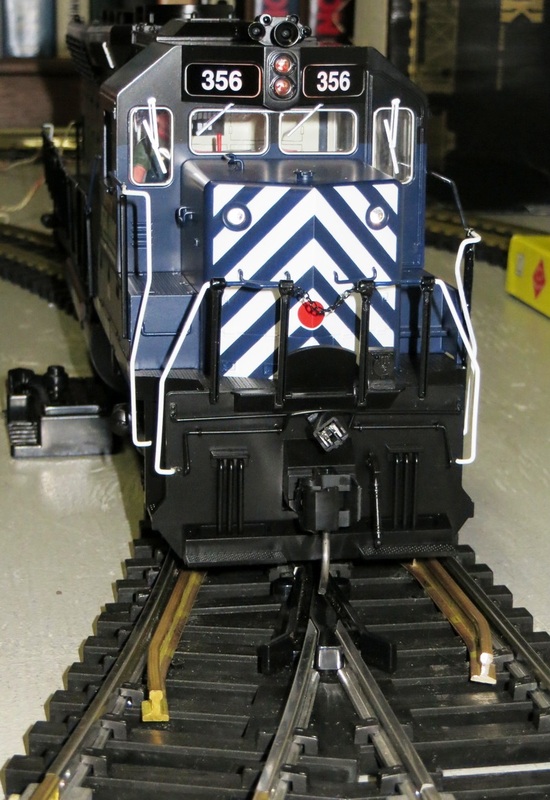 Since the Aristo factory did not pre-install the loco railings on the SD45, it is best to first install the extra weights. 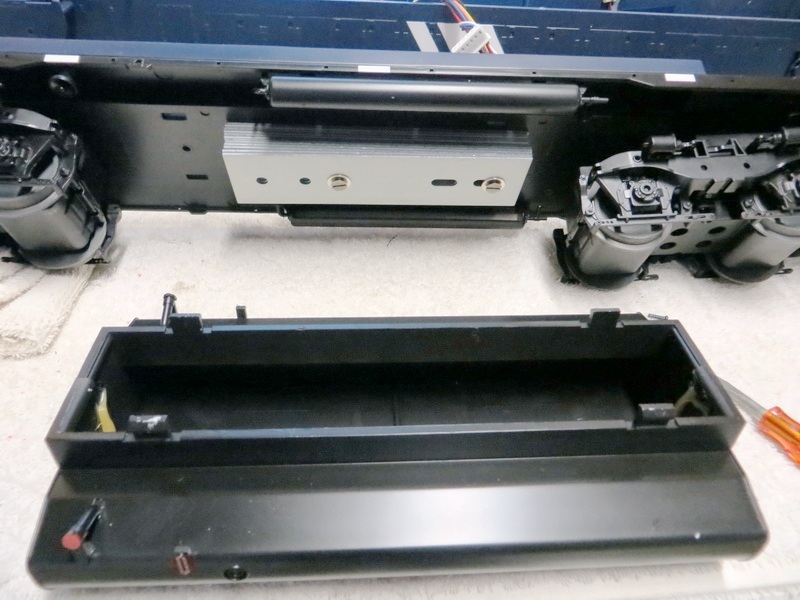 In order to install the extra weights, the plastic fuel tank must be removed, but unlike newer Aristo diesel loco designs like the GE Dash-9, the body shell must be removed first. Some folks only remove the long hood, but I found it very easy to remove the entire body shell. There are 10 small screws that retain it - all located on the underside of the loco having engraved arrows in the chassis pointed to most of the screws that are allocated to the long hood. 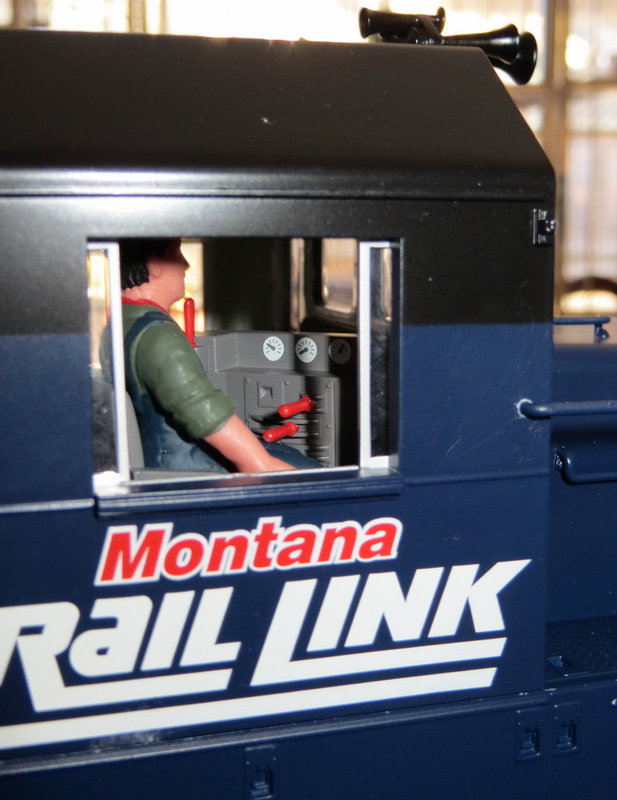 Once the body shell is taken off of the loco's chassis, the electrical connectors are easily unplugged. The SD45 plastic fuel tank has 4 plastic tab clips (2 on either side) rather than screws that are meant to secure it to the loco chassis. 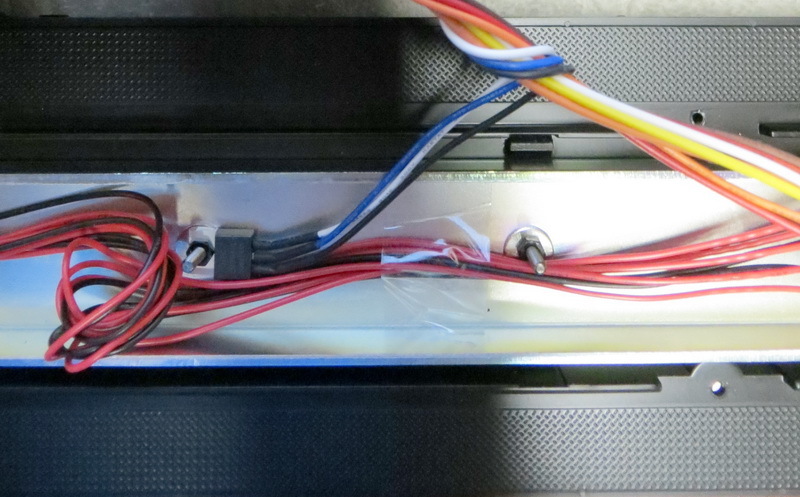 An air gap is visible between the tank and chassis once the tabs are popped out. Once one side is popped loose, the other side comes off easier. With the fuel tank removed, the single factory installed weight can be seen in the center. As can be seen below, the Aristo factory used glue in addition to the screw / bolt to secure the standard weight. No doubt this makes it very awkward if one were to try to remove it, but it most certainly won't come loose from vibration during shipping or operation of the loco. 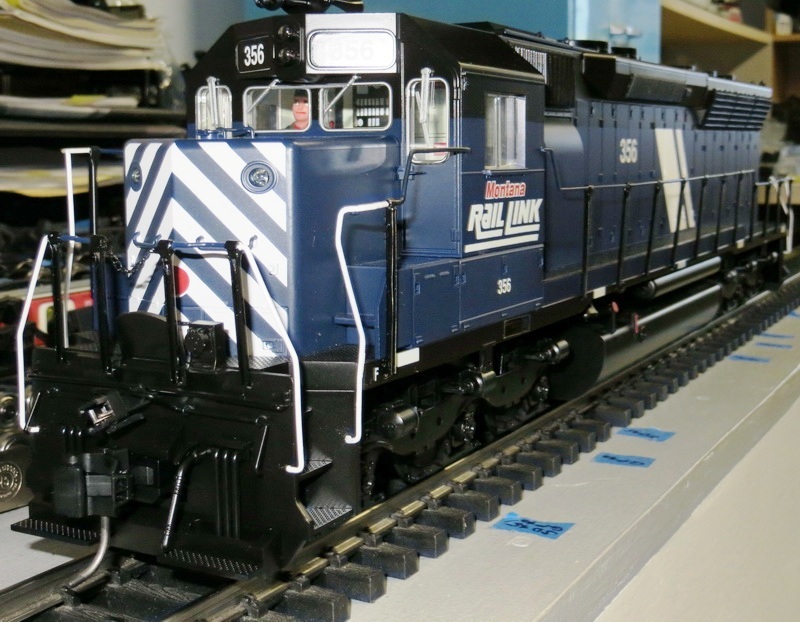 Shown below is the Aristo SD45 extra weight set. Although the current Aristo policy is to provide weights no longer made of lead, the ones I received were indeed lead, and as such at a collective 3.52 lbs weigh almost twice as much as their zinc counterparts to the benefit of the loco's traction improvement for the purpose of which they are intended. As can be seen in the above picture, one side of the weight includes a recess - apparently intended for keeping the screw / bolt fastener head below the surface of the weight to minimize any fitment interference once installed in the fuel tank area of the loco. However, the factory did not appear to have reason to make use of this feature. 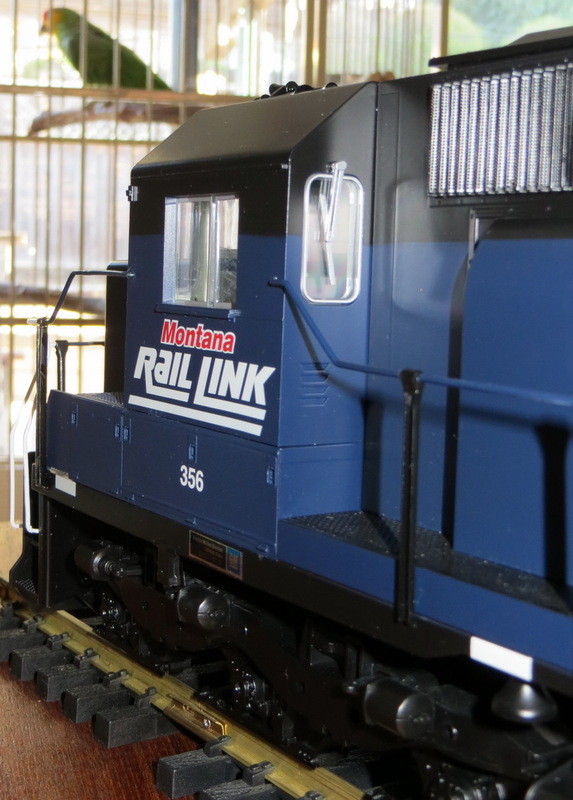 The SD45 is standard with only the center weight installed by the factory using both the bolt and glue! Use the factory provided washers and bolt as shown below to fasten the extra weight to the underside of the loco. The extra weights are installed on either side of the factory installed center weight. To guard against operational vibration potentially working loose the weight, I chose to use an additional lock washer (to be placed under the nut) that was not supplied with the weight set as I did not want to add glue to the weight like the factory did. When securing the weights, provide for a small amount of clearance on either side of them for the slots meant for the plastic fuel tank tab clips to pop in. The below picture shows the chassis side of the loco's frame that include the projecting bolts, fastening washers and nuts that secure the weights. 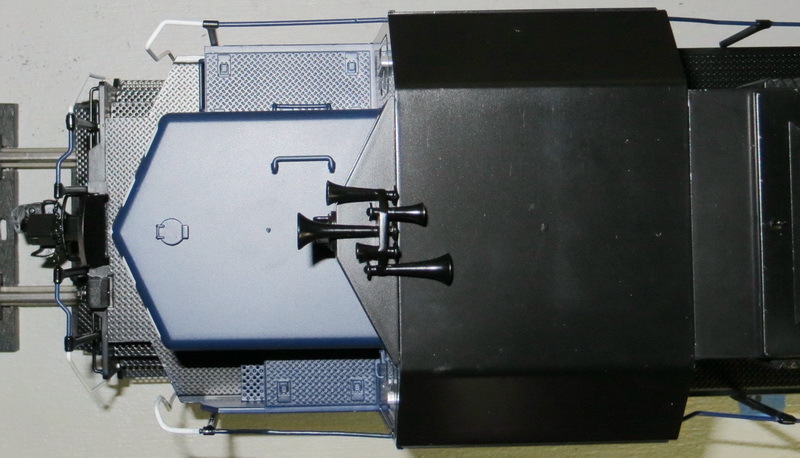 Shown below is the box compartment that houses the pre-painted railings. As can be seen, the railings are located on the bottom foam section covered by a cardboard flap. 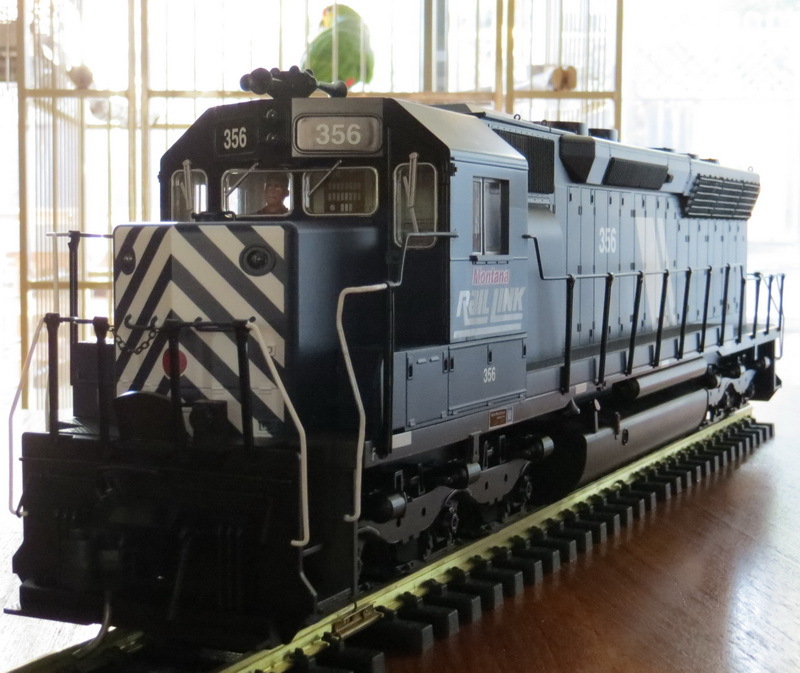 I have installed the railings on many SD45s in the past, and this most recent example has caused a refresh in my memory for the lost art of doing so since I purchased the Santa Fe SD45 having taken advantage of a sales promo. As a preliminarily measure, it is best to first see how the railings' wire and spring clips seem to fit into their intended openings without actually forcing them in. This particular example SD45 seems to have had a fairly thick coat of factory paint applied to its metal railings - more so than I recall on prior ones. For all the SD45s I have done, I first had to use a pin vise with a #53 drill to clean out the paint from the round holes intended for the railing wires to fit into the side of the loco's cab. For installing the side railings, I typically use a plastic mallet to seat its stanchions spring clips - progressing one by one - into the slots along the side of the loco. Because of the paint build up on this example loco’s railings, I first had to somewhat squeeze the spring clips with a pair of small needle nose pliers. If this needs to be done, do not squeeze the spring clips completely shut. 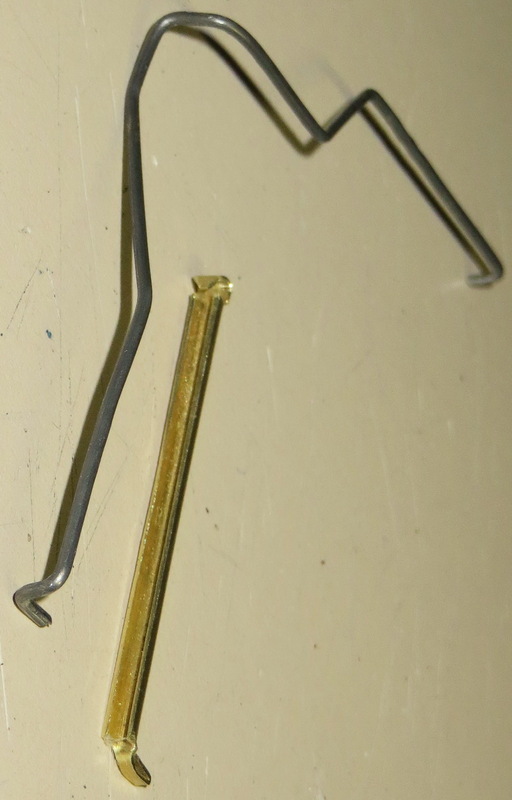 In some drastic cases, filing excess paint off the surfaces of the spring clips may be needed, too. 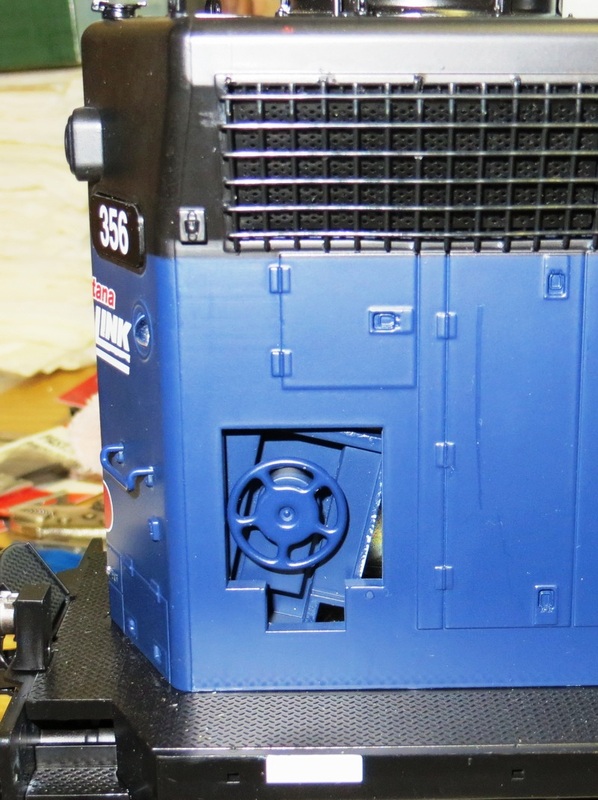 MLS FORUM member, Jim Carter, presented a good tip on how not to squeeze the tabs too much by inserting the tip of an Xacto blade placed between the clip opening, thus, serving as a thickness gauge. Squeezing the clips closed against the blade makes for a consistency, too. 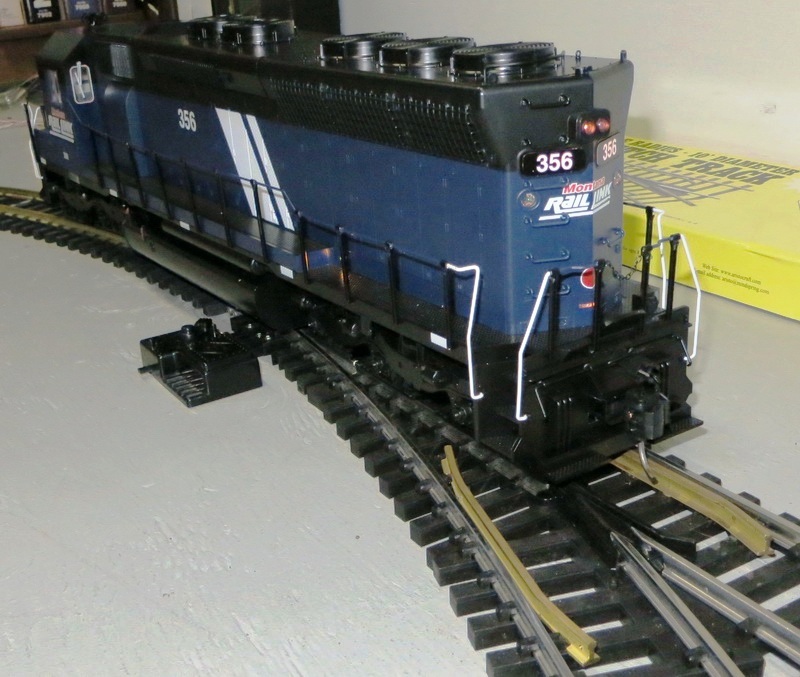 Comment: Having since purchased a pair of USA Trains SD70s, I noticed its railing clips (in contrast to Aristo’s) were mostly too loose fitting when attempting to install them - so these clips had to be pried open some by inserting an Xacto blade tip with a slight twist motion. Perhaps this would be a better approach for Aristo to adopt so long as they advise the perspective customer, accordingly. Whilst discovering the hard way that the paint was too thick on the stanchion clips, sometimes things don't go right. Since many of the slots along the side of the loco are very close to the edge of the plastic frame, they risk being broken. Note the inconsistency of the slot proximity between the two sides of the loco. This is not limited to only the Santa Fe SD45 road name. Apparently other SD45s exhibit this, too. 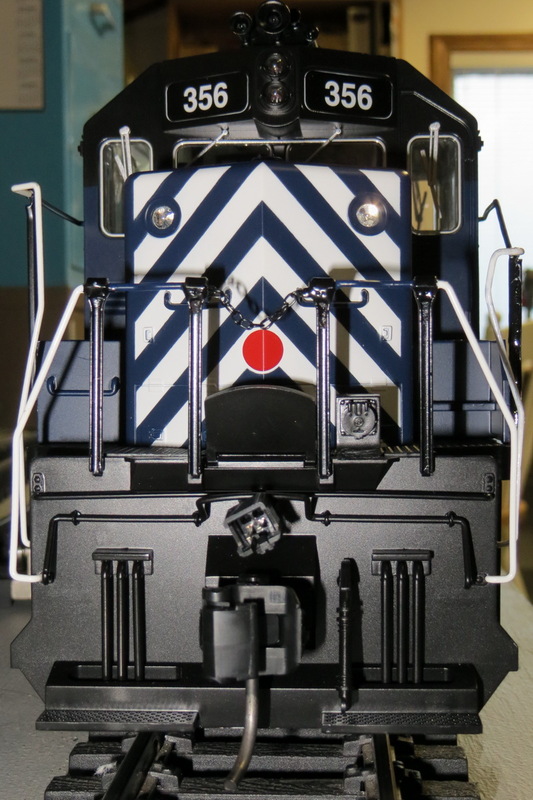 In this regard, shown below is an example Aristo Southern Railroad SD45 left side view of the side railing slot locations with these slots being position reasonably good. However, as shown below this right side view of the same loco side railing slot locations are way too close to the bottom edge and risks breakage of the plastic when installing the side railings. Hopefully, for subsequent factory production run of SD45s, Aristo will have taken notice and resolved the tendency for the slots on whatever side of the loco being too close to the bottom of the frame. 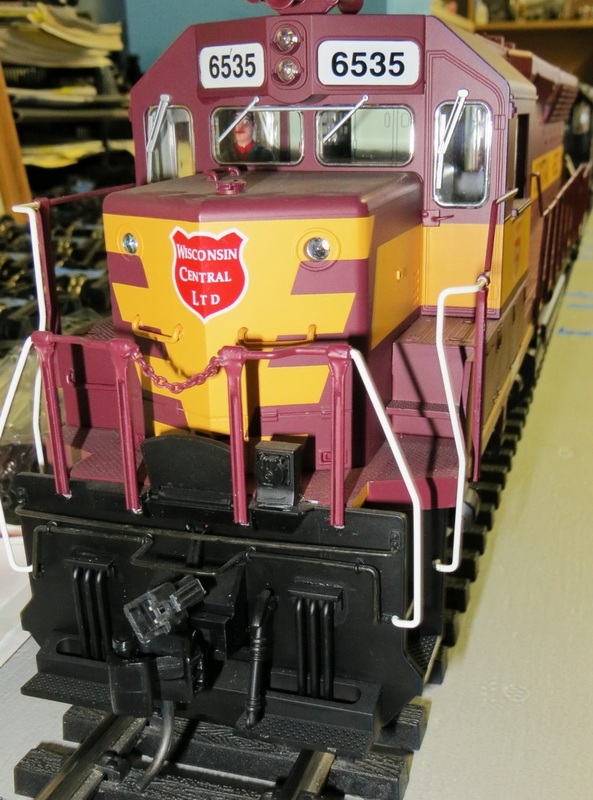 Shown below is the one example broken slot on the Santa Fe SD45 that I repaired using CA glue. 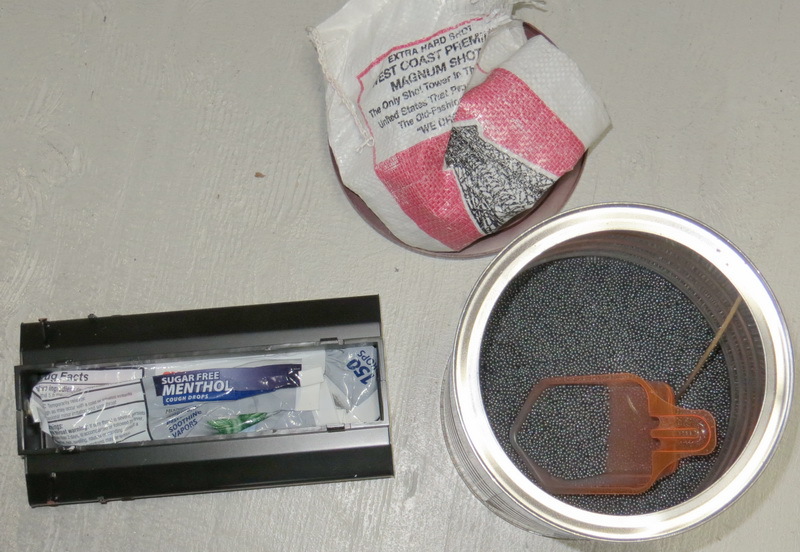 Once the glue was dry, and before I did the re-installation, I squeezed this particular stanchion clip closed and took more paint off it with the file. (Paint touch up matching the loco’s yellow is needed to make for a better appearance than what is seen in the picture to cover up that CA glue residue. (Presumably, Floquil - F110178, ATSF Yellow will work. The pilot railings require a little more preparation. Again, because of the excess paint, I partially squeezed the stanchion spring clips and also filed some of the paint off of both sides of the clips surfaces. Once the preparation is completed, install the pilot end railings as shown below using a plastic mallet with the wood dowel as a "buffer". The completed SD45 with the installed two extra lead weights and its railings measured about 14 lbs. 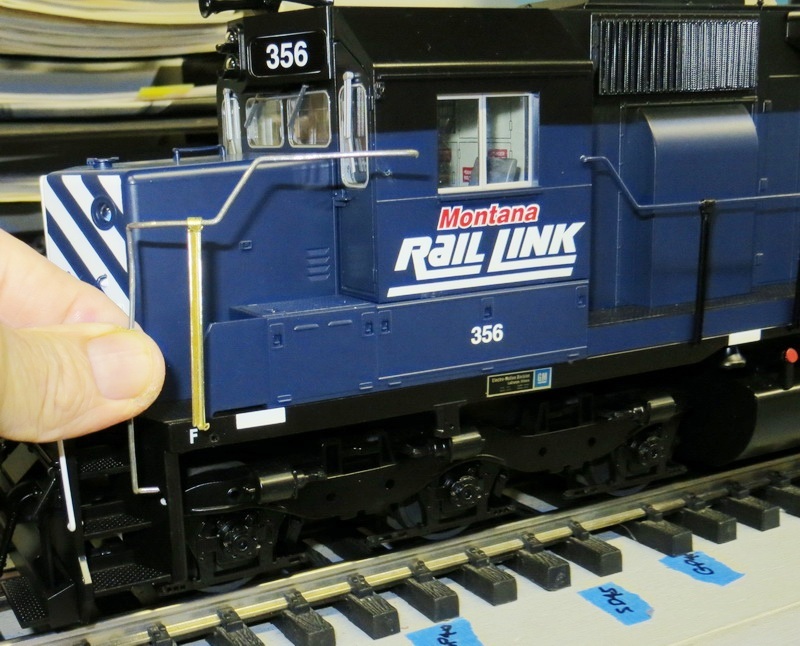 For folks interested in the SD45's electrical internal workings, See Greg Elmassian's evaluation for Motiive Power, SD-45. 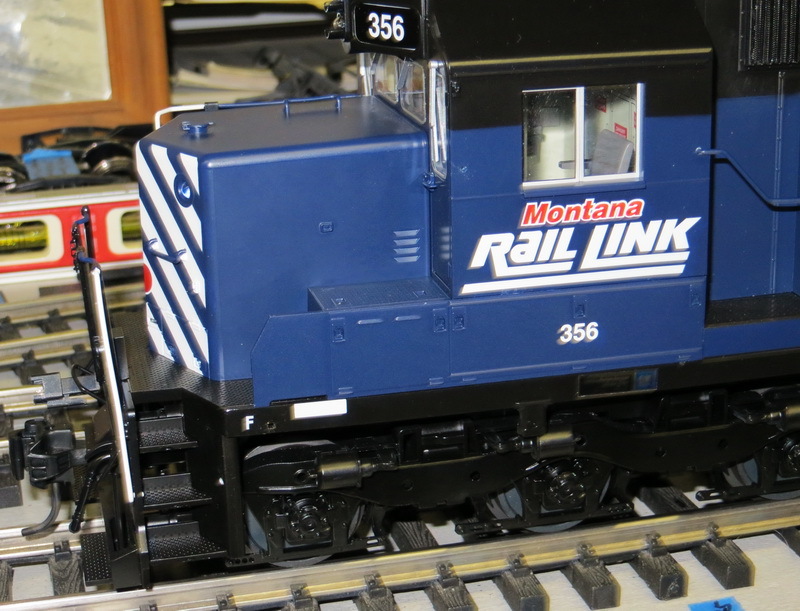 Shown below is the Aristo yellow box having a sticker identifying the Montana Rail Link (MRL) SD-45 as a "New 2012 Version" . 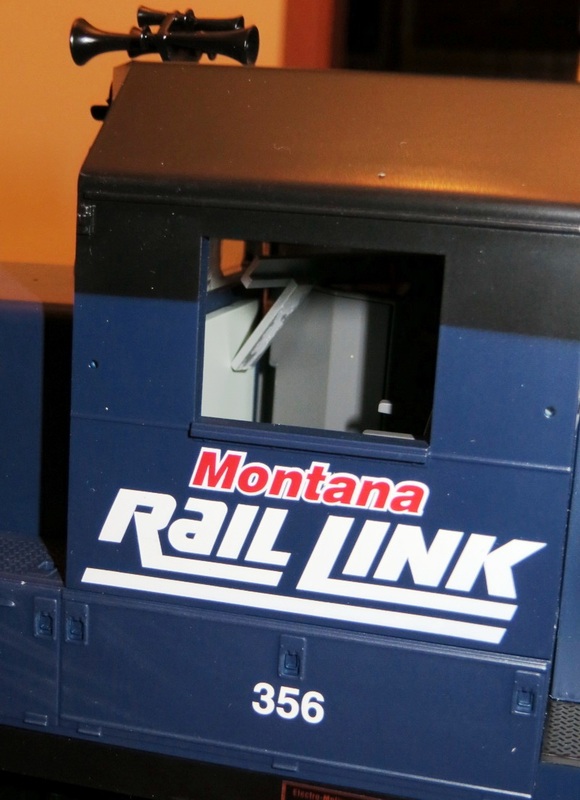 The MRL SD-45 is among the last production run units prior to Aristo-Craft going out of business as of year end, December 2013. The MRL loco I acquired new did have some changes from prior production runs, with my particular unit, also, suffering from factory quality problems, compounded by the rigors of transportation. Depending how the loco was positioned, the various parts ended up on the engineer's side. Window parts could not be "fished out" of the engineer's side because the engineer's cab rear window was glued in the closed position - it's suppose to slide open. Rear motor block had an open circuit on one electric motor lead due to a cold solder joint at one of the "forks" that supplies power to it. This caused only one of the two motors in the rear block to operate - resulting in delayed response, slow operation and weak performance. First, remove the bottom cover from the motor block. 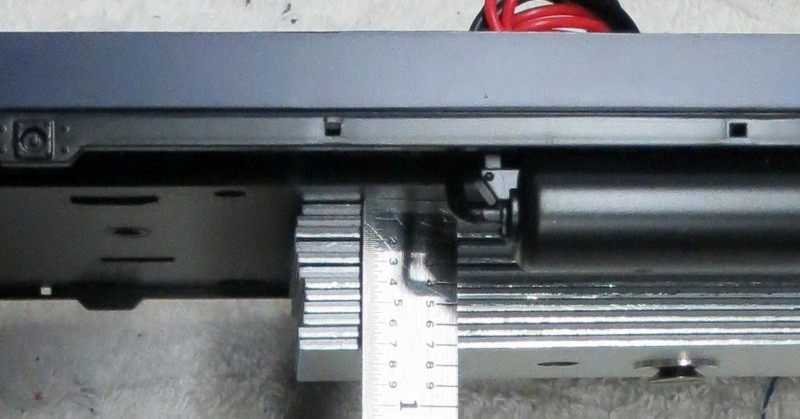 The motor block's short length bright metal center strip on the top side internally includes "forks" hidden in motor block that connect to motor leads. 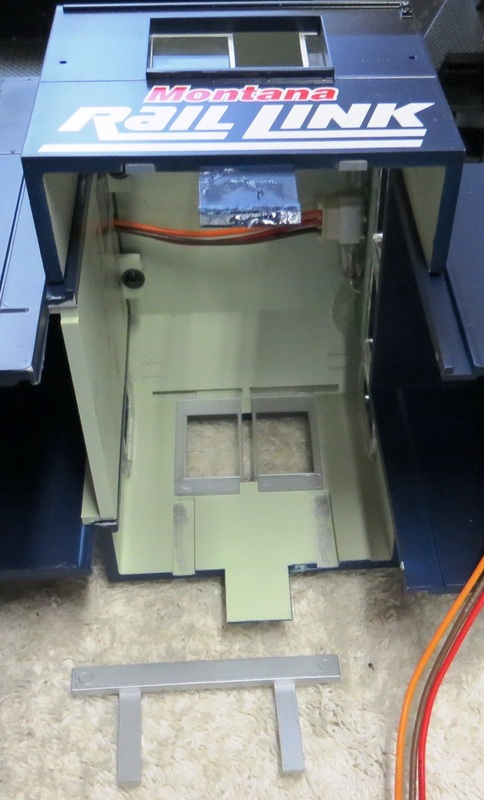 Connect clip-on jumpers from the motor block's bright metal center strip on the top side to a bench power supply that is to be used for running the motors. Power up the bench power supply and adjust it so the motor/s are running at a low speed. 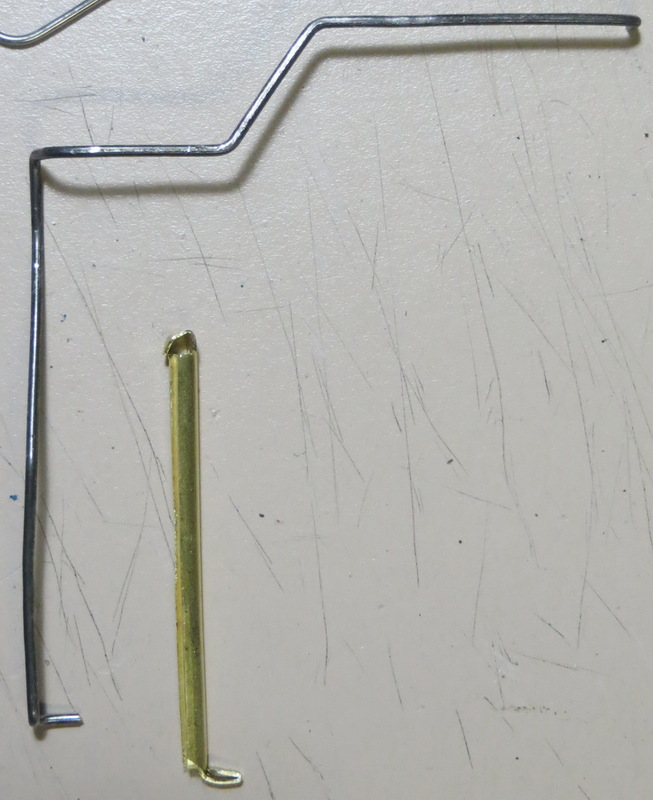 Use an object like a small metal paper clip bent out at one end and ground with a pointed tip so it would fit down in the crevasse where the motor leads connect to the forks. Having located the bad connection, remove the wheel to gain access to the "U" access slot provided on the side of the motor block so a soldering iron tip can be inserted to resolder the connection. 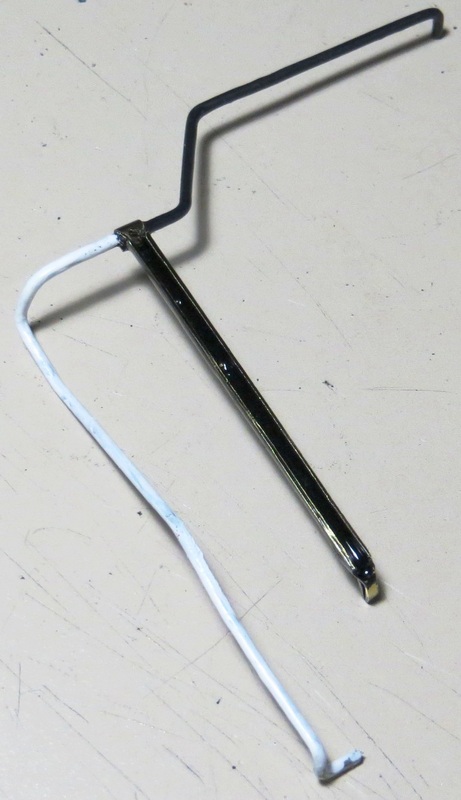 Shown below is an example of the soldered "Fork". 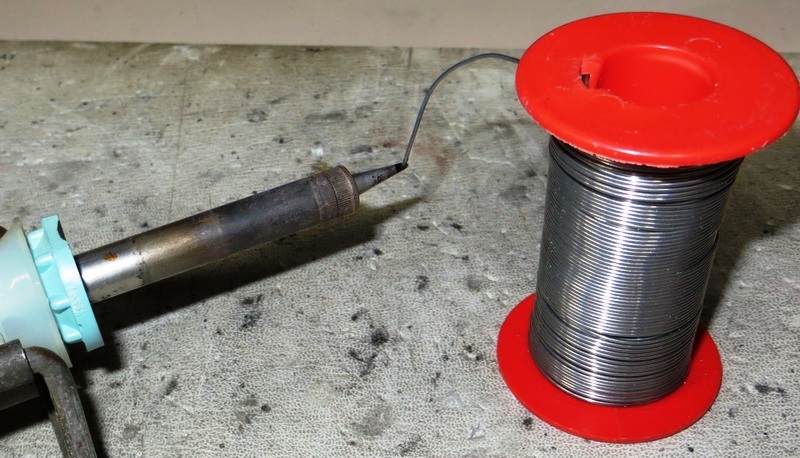 A 50 watt preheated soldering iron with a pencil tip was small enough ("tinned" and augmented with rosin core solder) to be inserted into the slot, touching the fork / motor lead junction, to good effect. Wheel treads shed black finish. This can cause rail head deposits resulting in poor electrical pickup for track power users. After about 2 hours of run-in time the wheel tread surface appears to be rather rough. Though the loco seems to operate well so far, and has very good traction with such roughness, track power users will find this to be a potential problem for electrical pickup. Therefore, it appears these "D" hub type wheels made of what seems to be sintered iron are better suited for battery powered locos. No matter how many emails sent using different addresses and phone calls made to Aristo service, I could not even find out if a replacement part was available. None of the emails were answered, and the one of several phone calls to Navin was on hold indefinitely. Navin is normally very good, but I suppose the pending Aristo out of business had ill affects. 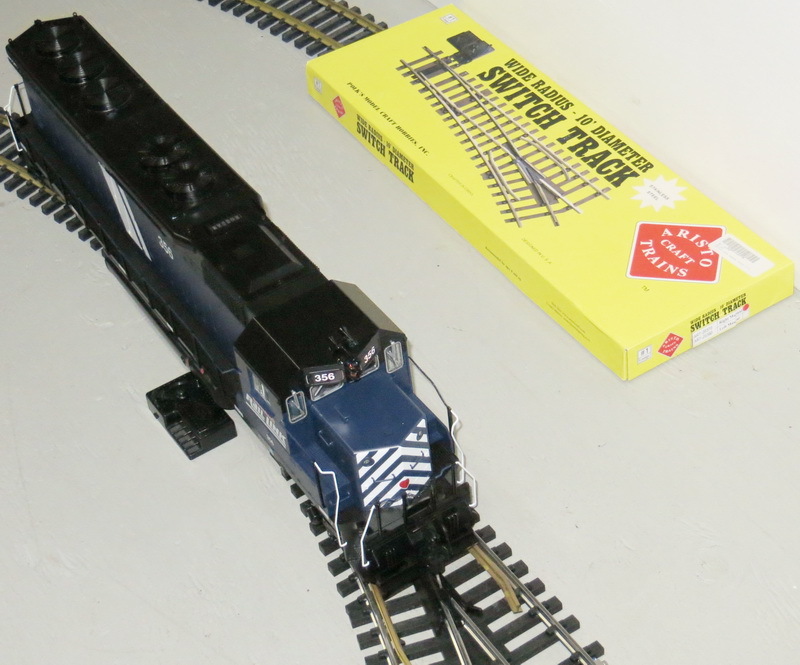 Since I could not get a new replacement part, I first considered purchasing a USA Trains hand railing assembly from an SD-40 or GP-38 for adapting it to the SD-45, but these did not match the shape of the SD-45 hand railing. Moreover, both Aristo and USAT railings are made of hardened wire that if bent too much can break, so trying to modify these would be impractical. Consequently, I decided to fabricate a hand railing assembly of maybe less than satisfactory appearance with the idea of getting the proper assembly (new or used) at some later date. However, I was able to fabricated the assembly with its stanchion to look almost identical to the original. The stanchion was the most difficult part to replicate. 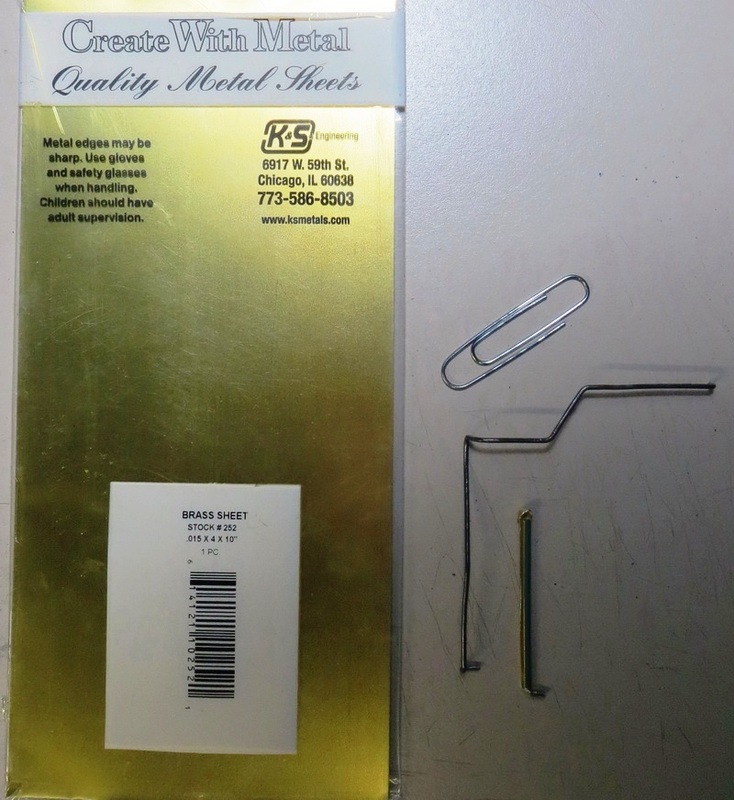 To fabricate the assembly, I used a large paper clip and rebent it to the desired shape. I then made the stanchion, using 0.015 inch thick brass sheet material purchased from Orchard Supply Hardware (OSH). Shown below are views of the left front hand rail assembly. To form the stanchion by hand was difficult and time consuming, but I was able to do it using a machinist hammer, pliers and hobby vice. I cut a 1/4 inch strip from the sheet brass and used the non teeth, reinforced edge of a worn out razor saw to shape the "U" channel of the stanchion. As it turned out, the thickness of the non teeth edge formed about 0.100 inch wide "U", so it was close to being like the factory stanchion. To do so, I was able to prebend the brass strip like a "V" and then put it in the vise and squeezed whilst the hammer was used to strike against the teeth of the razor saw to seat the bottom of brass strip, making it a "U" from the "V". It took much checking to avoid twisting the channel as I progressively formed the "U". Easier than I first thought, I was able to replicate the upper wrap and lower clip ends of the stanchion. The clip end goes into the loco side frame slot, thereby fastening it to the loco. 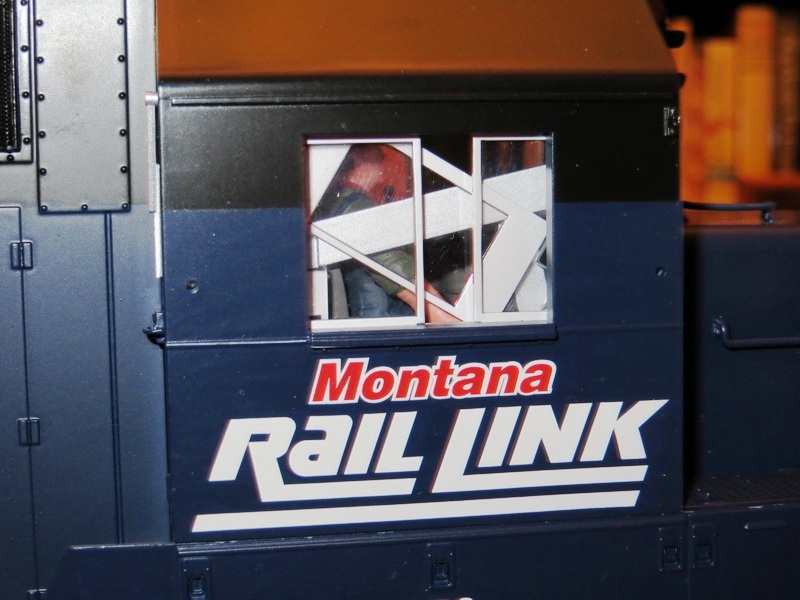 Once the stanchion was fastened to the railing, I painted it to match the MRL SD-45 colors. The left front hand rail bends and stanchion size had been copied from another SD-45. When installed, it looked very much like a factory made part. A comparison can be seen from the above MRL SD-45 fabricated railing and the below Wisconsin Central original "master". Shown below are more views of the loco before and after the fabricated hand rail assembly was installed. Shown above and below are top views. Shown below are side profiles. Repairing (regluing) the Cab Windows & Brake Wheel Assy. The inside of the cab is accessible by first removing the entire body shell, then removing the "boxes" on either side of the nose, then the front bulkhead (below the front windows) can be slid out, then remove the two screws that hold the floor assembly to the cab. The floor assembly can now be withdrawn. The windows are to be placed in the slots (making sure you orient them correctly), then the lower frame that retain them (and slide against) is bonded into the cab's channels using CA type glue. To repair the engineer's side, the windows were popped loose and lower frame reglued, so the windows would now be able to slide open as they should - shown below with everything reassembled. After regluing the cab windows, the brake wheel assembly was, also, reglued with the shell off. Shown below is the MRL SD-45 assembled with the brake wheel in place. 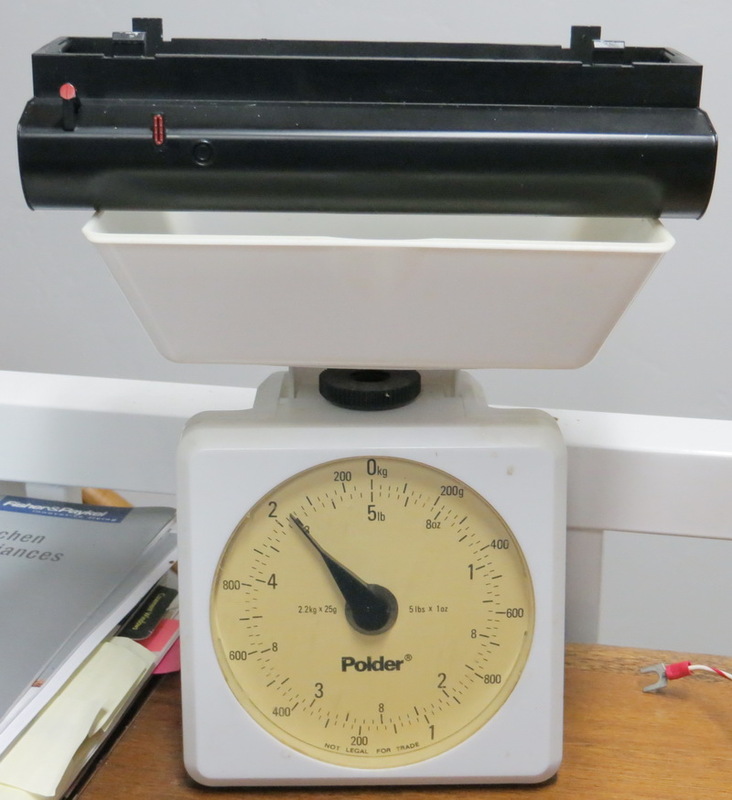 The MRL SD-45 out of the box weight measured 9.6 lbs. Additional weight can be placed in the bottom of the fuel tank - keeping in mind to maintain a clearance of about 0.70 inch for the existing weight stack of plates with the tank installed. 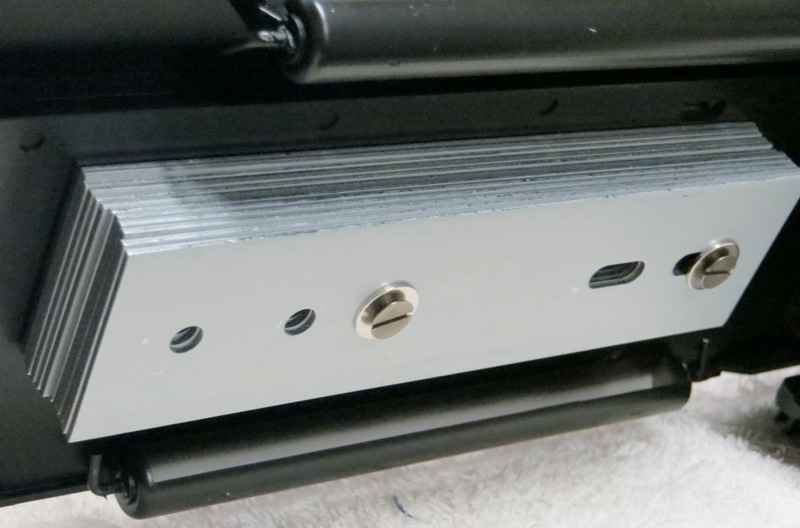 The weight stack is held in place by two screws and nuts to the chassis. It need NOT be removed to add additional weight. The fuel tank is held in place by two plastic tabs on each side of the upper part of the tank. These can be pried and popped out by inserting a small flat blade screw driver against each of the tabs from the top side once the body shell is removed. 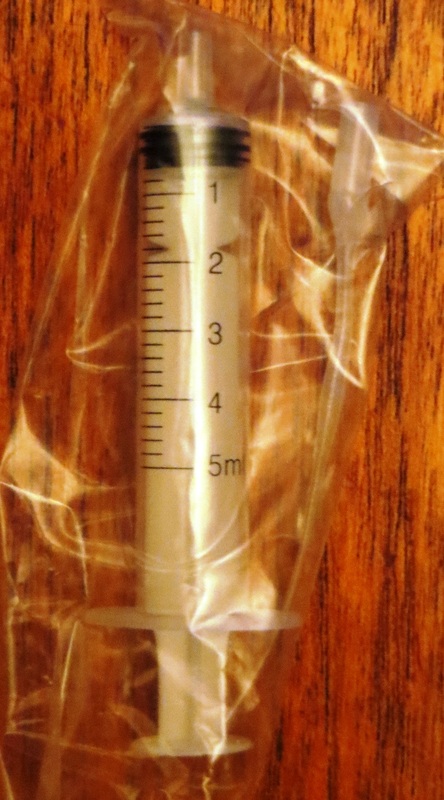 I chose to use number 9 lead shot (obtained from a firearms store) placed in a zip lock bag repurposed from holding cough drops. Since no. 9 lead shot balls are very small, I lined the zip lock bag with another plastic bag for added assurance so the little balls would be well retained. The bag is placed in the tank and then filled with the no. 9 lead shot whilst "kneading it" into the tank's lower side crevices using my fingers and thumbs. By adding about 4.5 lbs to the tank, the weight of the MRL SD-45 is close in weight to prior production run units having 3 lead weights. There is a bit more room in the tank to add more lead shot if so desired. 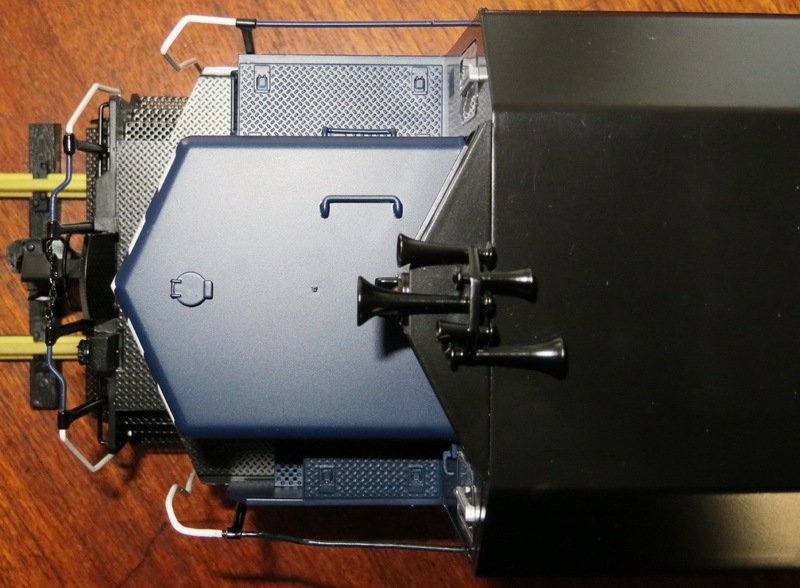 Once the tank is weighted, it is popped into the chassis and held there by its 4 plastic tabs. 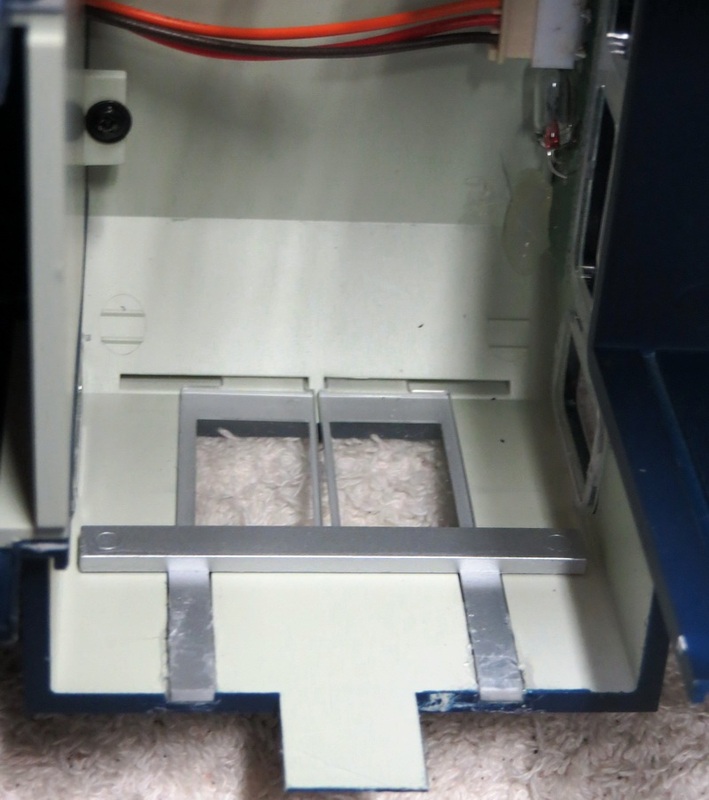 Because of the extra weight, to assure the tabs would not pop loose, an object can be forced into the slot adjacent to each of the installed tabs. I used Q tip stubs. With the added weight, the completed loco now weighs 14 lbs. The "D" hub wheels have a more-or-less interference fit on the axles, perhaps owing mostly to the finish thickness. The wheel is fastened to the hub with a 2.5 mm screw and external tooth lock washer. With the screw backed out or removed, avoid trying to pry a wheel away from the motor block as that will risk damage to the gearbox assembly. Unless it can be coaxed off with light finger tension, use a wheel puller. Along with the material change, the axles are no longer tapered, now having a flat to accept the "D" hub wheel to better keep it from spinning. Also, there is a ridge on the axle that establishes wheel back to back spacing. Shown below is the "D" hub type wheel being removed. For comparison, shown below is an example PRIOR version wheel that mounts on a tapered axle. Compare that prior version wheel to the newer "D" Hub wheel shown below. In keeping with Aristo's classic practice of having too tight wheel back to back spacing, the MRL SD 45 "takes the cake". This was discovered on corrected turnouts where the loco wheels would "bind-up" when traversing the frog area. Since the axles now have a ridge, washers can be used to easily correct the spacing that was very difficult or impractical to do with the prior version tapered axle design. Shown below is a method to correct wheel back to back spacing. With the wheel back to back spacing corrected, the MRL SD 45 traverses a corrected Wide Radius turnout in any direction and path with ease - and that's with its wheels' reduced flange depth.